Lessons On Time Loops And Power Loops From 'Doctor Strange' : 13.7: Cosmos And Culture The film reminds us we are the sum total of our choices and must consider carefully where they lead — good to remember in these post-election days, and in life, says astrophysicist Marcelo Gleiser. 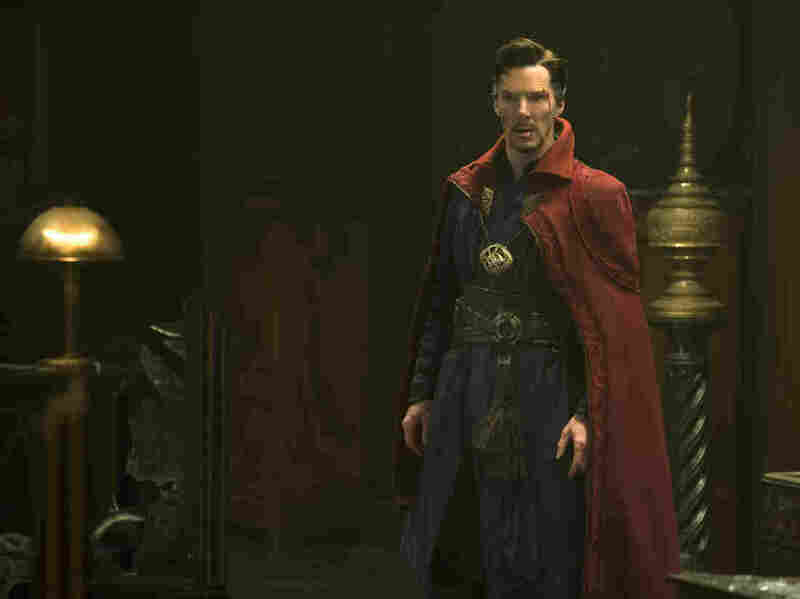 Benedict Cumberbatch plays "Doctor Strange" in the film based on the Marvel comic. "It is not about you," says the Ancient One, marvelously played by Tilda Swinton in the movie Doctor Strange — based on the Marvel comic — released in theaters last Friday. She is talking to Dr. Steven Strange (Benedict Cumberbatch), who is at a crossroads: either return to his previous life as a superstar-conceited neurosurgeon, or use his newly acquired mystic powers to save the world. Sometimes life will do that to us, reorienting our path with unpredictable suddenness. What can a narcissist do? Well, first he will do whatever possible to revert the situation, to go back in time and restore his status. Unfortunately, and here is an important lesson, we cannot bend time backwards. Nature's awesome powers are beyond our reach. The laws of nature must be respected. They make (or should make) us humble. That is, unless the threat is such that we must reconsider — and we have mystic powers that are nothing short of godlike. Under such unfair odds, the status of a famed neurosurgeon pales in comparison. The doctor that heals others to catapult himself into stratospheric fame steps up to become the master sorcerer that can beat time itself to save the world. Not a bad gig. "Time is the enemy," says Kaecilius, the powerful bad guy played by Mads Mikkelsen, seduced by the possibility of controlling it. This is the central theme of the movie, our mortality. Should we accept it, as the Ancient One suggests when she says "death is what gives life meaning," or should we try to beat it, even if that means going to the dark side? Can there be good and evil masters of time? If we can walk backwards and forwards in space, why not in time? Scientists, especially theoretical physicists, like to play such games — controlling time with pencil and paper. Going forward in time, traveling to the future, is actually OK, according to the Theory of Relativity. All we need is a super-fast spaceship, traveling close to the speed of light. A technological, and not a conceptual obstacle. Going back in time is more complicated. Much more. Remarkably, closed-time loops are not just the stuff of sci-fi stories. (Why a closed-time loop? Most people don't want to go back in time and be stuck there. A short visit to the past should suffice.) In 1949, the brilliant Austrian mathematician Kurt Gödel found a solution of Albert Einstein's equations of general relativity where it is possible, at least theoretically, to travel in a circle in time as we can in space, returning back to the starting point. The movie brilliantly plays with this notion, not least since 13.7's own Adam Frank worked as a scientific consultant. In practice, Gödel's solution and any of its modern versions are a very, very long shot. There are issues with how to keep such spacetimes from collapsing upon themselves, not to mention weird time paradoxes like the Grandfather Paradox: If you travel back in time and kill your grandfather before he marries, would you exist? However, in a Marvel universe it is possible. When Dr. Strange discovers that he has this power, we see a disturbingly beautiful image of an apple being eaten and reassembled again and again, a small patch of space where a closed-time loop is possible. To protect the Earth, Dr. Strange travels to the multiverse, here an infinite set of universes, each with different natural laws, echoing some of the cutting-edge and somewhat outrageous ideas in theoretical physics. Evil powers dominate some of these in the shape of Dormammu, Master of the Dark, who, for some unexplained reason, wants to expand his domain and destroy more and more worlds. Ungrateful job, to keep destroying worlds in an infinite multiverse with an infinite number of worlds. A kind of cosmic Sisyphus, prisoner of his own greed. This is important. For the movie tells us that power is a trap, where the presumed powerful one is a prisoner of his own thirst for power. It's life in a closed-power loop. It can only lead to despair. A final special touch happens when Dr. Strange understands the source of the Ancient One's longevity. She chose to dig it from the dark side, in a twisted plot convolution where the bigger moral goal eclipses the steps to get there. In the case of the Ancient One, that's forgivable given that she is the protector of our world. But the danger is that others, with lower moral standards, stuck in their own power-loops, may also decide that similar choices are justifiable. The consequences are usually tragic, as people and values get trampled along the way. We are, after all, the sum total of our choices, and must consider carefully where they lead. Something good to remember in these post-election days and, as the movie reminds us, for life itself.